Today we are excited to release two great features aimed at helping you personalize your experience when using Travis CI: the user dashboard, and build email settings. The user dashboard allows you to better focus on the projects you care most about. The dashboard gives you the ability to view all active projects you are a member of, and star the ones you want quick access to. Additionally, we have also added the ability to view and access the most recent builds created by you under “My builds”. This is specially handy for viewing the result of all your recent commits! This has been a beta feature for a while, and now finally becomes part of our top bar for easy access by all: travis-ci.com/dashboard. If you want to make the Dashboard your default home page once you’re logged in, you can activate it in your Account Preferences, here. As you may already know, every time Travis CI finishes one of your builds, you receive a email from Travis CI telling you if your build passed or failed. Build status emails now offer more granular options so that you can choose which repository you’d like to stop receiving emails for. You can unsubscribe from all build emails, or if at a later stage you want to re-subscribe to a repository or two, you can do this by heading over to the Email settings in your Account Preferences, here. In case you’re curious, our build status emails were recently redesigned!. 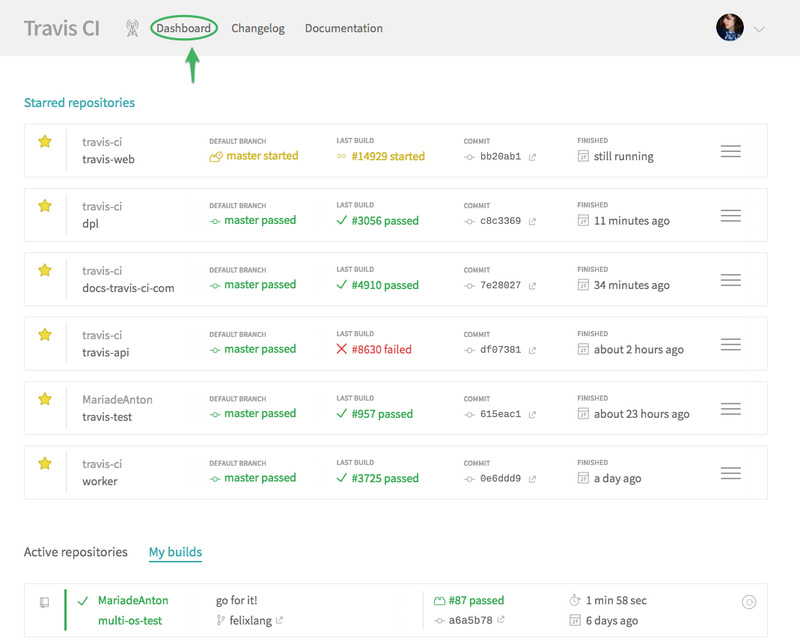 We really hope you enjoy this new options to personalize your CI experience with Travis CI! If you have any feedback or would simply like to chat about this come talk with us in our Community Forum!